Please check out http://koha-community.org/koha-3-20-0-released/ for the complete release notes. The website for the Koha project is http://koha-community.org and Koha 3.18.7 can be installed via packages, or downloaded from: http://download.koha-community.org/koha-3.18.07.tar.gz. Installation instructions can be found at http://wiki.koha-community.org/wiki/Installation_Documentation or in the INSTALL files that come in the tarball. You can read the full release notes at http://koha-community.org/koha-3-14-14-released/. The Koha release team are proud to announce the release of Koha 3.16.11. Otherwise you can download the tarball at download.koha-community.org. It includes 1 enhancements and 12 bugfixes. ElasticSearch integration in Koha is making progress. Since the announcement of the EBSCO grant to the Koha Gruppo Italiano this past February, the community, through an effort coordinated by ByWater Solutions, completed considerable work on the browse feature and enhanced patron functionality API access. Progress can be tracked through bugs #12478 and #13799 on the community Bugzilla site. Well, never fear! I started. Bugs 14110-14118, and 14120-14121 basically cover all of t’s noise, and start into t/db_dependent. Many have been signed off by Bernardo Gonzalez Kriegel (Thank you! ), but some have yet to be signed off. If you hate floody tests, take a look. Barton Chittenden writes about the importance of precise language when submitting support tickets and including a koha URL where possible. Chris Cormack writes about the wonderful community we’re all a part of in Koha Kindness. instances to librarians and students of library and information science in the German-speaking world”. Vimal Kumar shows you how to clean the fine amounts in Koha’s accountlines table. Christopher Brannon walks you through styling patron expiration dates with JQuery in Koha. Carmen Hernandez shows you the basics of patron management in Koha 3.18. Amy Kearns gives you a workaround for missing due dates on your Koha slips. Let Vimal Kumar walk you through Installing Koha on Ubuntu 14.04. DP Tripathi created a script for installing Koha 3.20 with a single command on Ubuntu 14-04 LTS. Pierre Vandekerckhove shows you how to add chat to your OPAC. The June general IRC meeting will be held on the 10th at 20:00 UTC. The agenda and other information is here. The June Development IRC meeting will be held on the 3rd at 15:00 and 22:00 UTC. They are also accepting presentation proposals – so Submit your talk! For more information, please see http://kohacon15.projektlinkkonsult.com/ . The Koha North American User Group Conference planning committee is seeking session proposals for the 2015 meeting on August 4-7, in Erie, PA. The committee invites proposals that: attract Koha end users such as librarians, technical services and support staff in libraries; offer work arounds for known system issues and bugs; highlight technological advances impacting Koha development; deliver work-flow best practices and innovative approaches to using Koha; utilize other open-source software within Koha; provide tips and tools for cataloging, serials management, accounts clean-up, patron uploads, record maintenance, and other system functions. 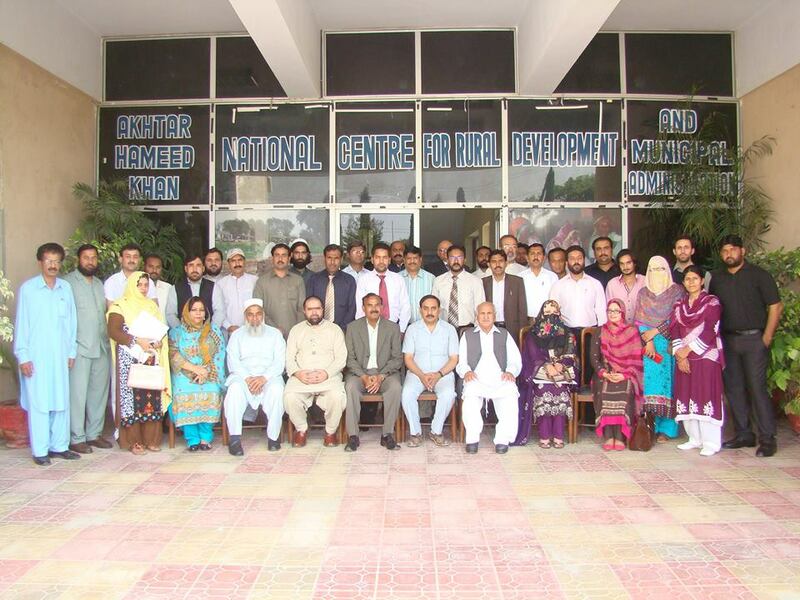 A five day workshop on “Library Management and Digital Resources were recently organized by the National Centre for Rural Development on April 13-17, 2015. More than 48 IT and Library Professional from across the country i.e Karachi, Baluchistan, Punjab, KP and Gilgat Baltistan attended the workshop. Mr Sher Afzal Chief Librarian Bahria University Islamabad was the key resource person. He delivered comprehensive sessions and hands on practice with Dspace institutional repository Software. The LIS professionals were trained about the Free and open source institutional repository software Dspace. The May general IRC meeting was held on the 6th at 20:00 UTC. The May development IRC meeting was held on the 19th at 21:00 UTC. Koha 3.16.11 is a bugfix/maintenance release. The branch for this version of Koha and future bugfixes in this release line is 3.16.x. The last Koha release was 3.18.7, which was released on May 26, 2015. As of 3.20, support for Debian 6 (Squeeze) is deprecated. The website for the Koha project is http://koha-community.org/ and Koha 3.18.6 can be installed via packages, or downloaded from: http://download.koha-community.org/koha-3.18.06.tar.gz. Koha 3.18.6 is a bugfix/maintenance release. It includes 2 enhancements and 65 bugfixes. Please check out http://koha-community.org/koha-3-18-6-released/ for the complete release notes. The website for the Koha project is http://koha-community.org and Koha 3.16.10 can be installed via packages, or downloaded from: http://download.koha-community.org/koha-3.16.10.tar.gz. Koha 3.16.10 is a bugfix/maintenance release. Todd Goatley writes about the recent conference for the Special Libraries Association in Abu Dhabi, UAE. Chris Cormack advises not to use CPAN on Debian or Ubuntu for the installation of perl modules. Use the package manager instead. Ed Veal shows you how to hide the new Auto-Renew feature in koha 3.18. Spencer Smith discusses Evidence Based Collection Management in Koha. Kyle Hall shares some jQuery with you for Fancifying Electronic Resources in your Koha catalog. Amy Kearns tells you how to reset the default receipt printer in Firefox. ByWater Solutions and EBSCO are offering a free webinar, Enabling Interoperability between EBSCO Discovery and Koha. Brendan Gallagher and Nathan Carulla of ByWater Solutions interviewed for an article in the Library Journal. The May general IRC meeting will be held on the 6th at 10:00 UTC. Details and registration information can be found at http://koha-fr.org/content/symposium-2015. Details and registration information can be found at http://vaarakirjastot.fi/koha-seminar-finland. Registration is NOW open!!! See the above website for details. 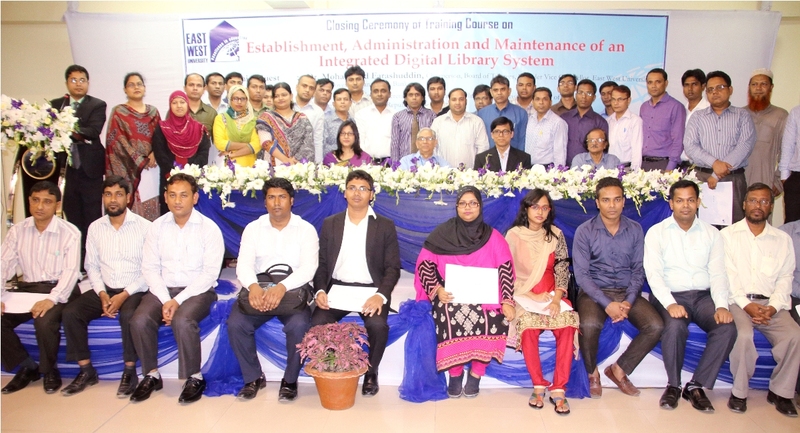 East West University organized two 10-day courses on “Establishment, Administration and Maintenance of an Integrated Digital Library System” from 11-24 February and 23 March-06 April, 2015 at East West University at the request of Bank and Financial Institutions Division, Ministry of Finance. 41 (forty one) officials (Library & IT) from 23 Government and Autonomous Bank and Financial Institutions of Bangladesh participated at the courses. EWU Library team served as the resource person in the training courses. The training covered Digital Library Overview, Library Management Software: Koha, Greenstone Digital Library Software and MARC21 Cataloguing. The participants developed their knowledge and practical skills on Establishment, Administration and Maintenance of Digital Library Software in the training course. Closing Ceremony of the training courses held at East West University on 06 April 2015 at 4:30 pm. Dr. Mohammed Farashuddin, Chairperson, Board of Trustees, Founder Vice Chancellor, East West University and Former Governor, Bangladesh Bank graced the occasion as the Chief Guest and Dr. M Aslam Alam, Secretary, Bank and Financial Institutions Division, Ministry of Finance attended as Special Guests at the Closing Ceremony of the training courses. Professor Ahmed Shafee, Vice Chancellor, East West University chaired the Program. The guests distributed certificates among the participants of the training courses at the program. Dr. Dilara Begum coordinated the training courses as well as the closing program. The April general IRC meeting was held on the 8th at 19:00 UTC. The April development IRC meeting was held on the 15th at 15 and 22 UTC. The last Koha release was 3.18.6, which was released on April 23, 2015. The members of the Koha release team are proud to announce the release of Koha 3.18.5.1. This is a maintenance release. Koha 3.18.5.1 fixes an erratum in the 3.18.5 release where a change needed for the proper functioning of the patch for bug 13380 (Auto fill order cancellation reasons from authorised values) had not been included. Libraries who have already upgraded to 3.18.5 are advised to upgrade to 3.18.5.1 as soon as possible. Koha 3.18.5.1 also includes an unrelated fix for bug 12399 (opaccredits printing at top on printable version). Please read http://koha-community.org/koha-3-18-5-1-released/ for the release notes. The Koha release team is proud to announce the release of Koha 3.16.9. This is the latest bugfix release of the 3.16.x branch of Koha. We recommend all 3.16.x users upgrade to this latest version. As always, you can wait a day or 2 for the packages to appear at debian.koha-community.org – or if you are still running from tarballs, you can download them at Koha Downloads. You can read the full release notes at http://koha-community.org/koha-3-16-9-release/. Koha 3.14.14 is a bugfix/maintenance release. On March 12, 2015 – Koha Gruppo Italiano organized the “5th Koha Italian Annual Meeting: Koha & SBN” as a part of the National Conference “Le Stelline“. Keynote speakers were Brendan Gallagher ( ByWater Solutions ), Paul Poulain ( BibLibre ) and Zeno Tajoli ( Cineca ). Gianluca di Bella ( Ebsco ) gave an introduction concerning the substantial grant given to the Koha Community for upgrading Koha. The meeting was moderated by Stefano Bargioni. We announced the substitution of Zebra with ElasticSearch in Koha and also further developments in the SBN module. These are both very important projects and will create a massive benefit respectively for the international and the Italian community. Event photos can be found on Flickr. Brendan Gallagher at ByWater Solutions writes about the Koha Fund Sub-committee and the responsibilities of volunteers. BibLibre discusses the recent Hackfest in Marseille. Joy Nelson has some great tips for troubleshooting Scanners and Koha Search Forms. Kyle Hall shows you how to set up Automatic updating of the Koha Offline Circulation borrowers file. Let Vimal Kumar show you how to quickly resize a folder of patron images for upload. Is your new Koha installation complaining of “missing perl modules”? Fix it with Vimal Kumar, as he shows you how to install perl modules through CPAN on Debian. ByWater Solutions will reimburse partner libraries for taking part in a Koha or open source speaking engagement. Nathan Carulla writes about this in his post, Koha Needs Your Help!. The April general IRC meeting will be held on the 8th at 19:00 UTC. The March general IRC meeting was held on the 11th at 10:00 UTC. An IRC meeting on the topic of fundraising for Koha development was held the 18th at 10:00 UTC.